Now that we know what he’s been up to professionally, I thought we could get a little more personal and try to get the real deal from Nathan’s other half Chelsea! 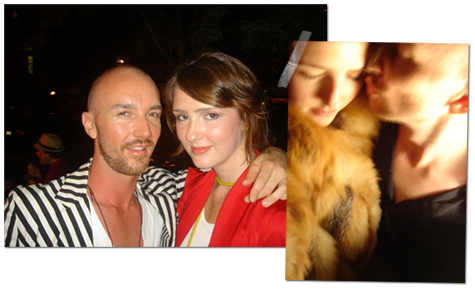 When I met Nathan… 10 years ago as transfer students at Pratt in Brooklyn. We lived across the hall from each other in an ex-housing project dorm that we nick-named “hell-o-bee” (a play on Willoughby Avenue where it was located). We were the only ones on the entire floor the first week. Total destiny. I introduced myself when I heard the Depeche Mode and smelled the cigarette smoke burning across the way. I was a little scared at first. He was wearing a cowboy hat and had no light bulbs in any of his fixtures. Smoke and candles only. Very apocalyptic chic. My sweet dorm room was decked out in inflatable furniture and multi-colored paper lanterns. I had pots and pans too. Total prepared chic. We became fast friends. I made the grilled cheese and he brought the smokes. I should note that I was 17 and he was like 20 when we first met. A HUGE age gap at that stage in our lives. I really looked up to him. Still do. I was named after the neighborhood in London where my parents met in the 1970’s. I live on an island off the coast of Seattle with my boyfriend. We met at RISD and have a small consultancy called Grain specializing in environmentally and socially minded design. I made the necklace that Nathan wore as a good luck charm the night he won Top Design. I love throwing dinner parties. I just started writing a blog about Northwest art and design that I haven’t really shared much yet called Village Mews. to support Nathan in his creative endeavors? board and give him their honesty. designer. He is very devoted to his projects and clients. graduate school at RISD in Providence and am now living in Seattle. to describe interiors, like “expensive chic”. It just cracked me up. 1970’s group called Chic. The lyrics are something like, “Chic! Chic! Dunnah-Dun-Dunnah Chic! Chic!” It’s a classic in our repertoire. Graceland and we dance-party simultaneously across the country. you’ve done to support Nathan in what he does? My lips are sealed on this one. thing about being Nathan’s BFF? can’t think back to any of it without cracking a smile. The hardest part is sharing him with all of you. project that Nathan has been involved in and why? friends would come to Brooklyn in limos. Ridiculous. proud to be his other half. WOW! Many many many thanks to Marichelle and Chelsea! Thanks Marichelle + Grace!! It is so great to have the opportunity to celebrate our friendship here on Design*Sponge!! This makes me love Nathan even more. Chelsea, if you ever need a third, give me a call! Nathan deserves all of his successes and much more. Chelsea really captured the essence of Nathan. Nathan, the salon… one word, …no, two!!! Fantabulous Chic!! Sweet and charming, but did they meet at Pratt (where I lived in that very project-turned-dorm) or at RISD? What, is she trying to trade up their academic/hipster credentials? Is RISD cooler than Pratt? i could be wrong, but from my reading of the interview, it looks like they met at pratt and then she attended grad school at RISD later. anyone know differently? Sorry for the confusion Dana. Yes, we met at Pratt. Nathan transferred to F.I.T. to finish his degree. I finished at Pratt then went back to grad school at RISD in 2005. Hope that helps! As for which school is cooler… Your guess is as good as mine. A warm hello! It has been several years since our last contact. You took my thesis writing class while you were a graduate student at RISD. I am still teaching the thesis mapping classes and have documented this process in book form. The book is soon to be published by Moth Press of Maine College of Art. Chelsea, I am writing to you now because I wish to ask your permission to quote you in the book within one of the writing vignettes. The passage speaks to a graphic inspiration that you referenced when creating your thesis document. Are you comfortable with this? If so, I will send a permission form in another email. I hope all is very well with you. I see that you are doing very well post-RISD.